This is the 3 secret menu for Honda Civic from year 2007 to year 2011. I’m not sure about the Honda Civic before and after that. The manual of the Honda Civic do not provide this information for user. There are 3 diagnostic menu for your speed, sound checking, radio system, hardware version, LCD checking. This is for the original radio system that come with Honda Factory only. There are 3 menus in this article. To enter the Diagnostic Menu 1, you have to Press and hold the 1 button and 6 button of your radio, and then push the PWR ( Power Button ). The LCD screen will display DIAG, means you are entering to the Diagnostic Mode. Press the 4 Button – ILM — HZ will be displayed. It is about the frequency of the light for Interior Illuminated Light. You can check the Honda Civic Genuine Accessories brochures for more information. ambience for the Civic’s interior. *The accessory Illuminated Door Sill Garnish Set includes 2-piece illuminated front door sill garnish and 2-piece non-illuminated rear door sill garnish. 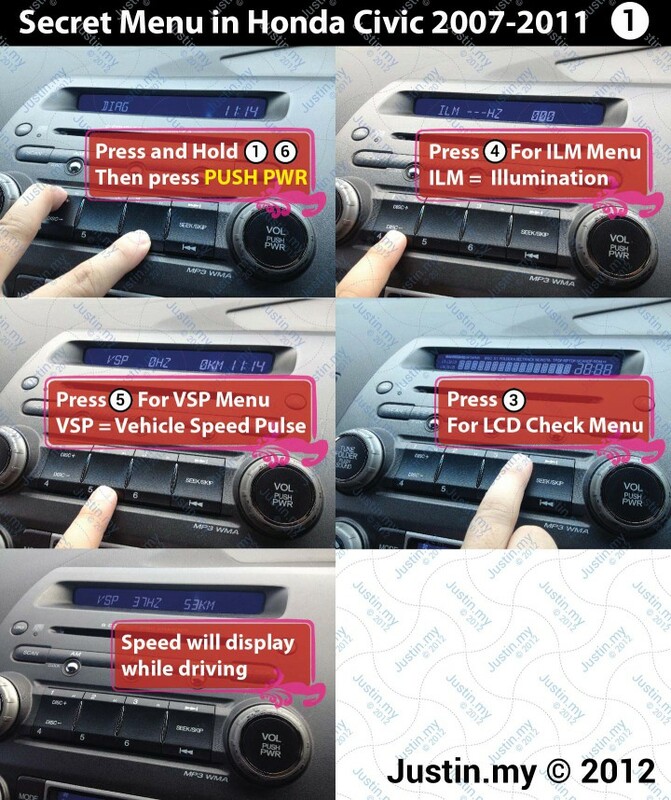 Press the 5 Button – VSP 0HZ 0KM will be displayed. Vehicle Speed Pulse is something likes Wheel Speed Sensor or Vehicle Speed Signal. It is using Bearingless wheelset speed sensors, so it will display the frequency HZ there. What is the HZ actually ? Is is calculating the speed using signa, the signal is 1.5 Hz per km/h. It is roughly to 1HZ per MPH. That means, if the signal is 37 HZ the speed is 53 KM/h or 37 MPH/h. The measurement is in no way accurate but sufficient. This will display full back light of the LCD screen that make sure none of them is broken.